The ad for the new add-on to Star Trek Online. 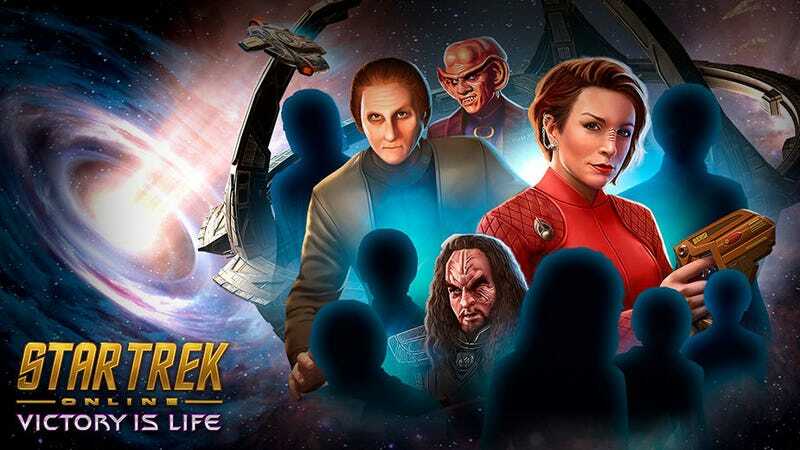 Fans who’ve been playing Cryptic’s free-to-play MMORPG Star Trek Online and felt a certain emptiness may have that filled with the latest expansion. It’s called Victory is Life and it’s inspired by Deep Space Nine. Just as the previous Voyager-themed expansion Delta Rising did before it, Victory is Life will see STO Captains return to a key location from Deep Space Nine—the Gamma Quadrant—decades after the events of the original TV show, getting a chance to see what it’s like long after the conclusion of the Federation/Dominion War that dominated the back half of Deep Space Nine. This isn’t the first time Star Trek Online has dabbled with Deep Space Nine’s extensive worldbuilding—the titular station is a major hub in the game’s MMORPG world and the site of some really cool storylines that tie into some elements left behind at the end of the show itself. It’s clear Cryptic has a lot of love for DS9, so giving it an increased focus and bringing back some familiar faces from the show itself is going to lead to some good, fanservice-y fun. There’s more info and images over on the official site, which you can check out here. Star Trek Online: Victory is Life launches on PC this June.